Finally Visual Studio 2010 is out and so is the Silverlight 4. I got few complaints that my MVVM demo applications are not working properly for people that have the new Silverlight 4 runtime installed so i updated all the examples so they run properly. Also all solutions files with code are recompiled and checked in final version of VS 2010 so this should run fine now. Expect soon more MVVM goodness on this blog, and until then – just enjoy the spring! In all my previous MVVM in Silverlight 4 posts i was avoiding to address one painful aspect of the Silverlight: calling WCF Web Services. And it was not without reason. 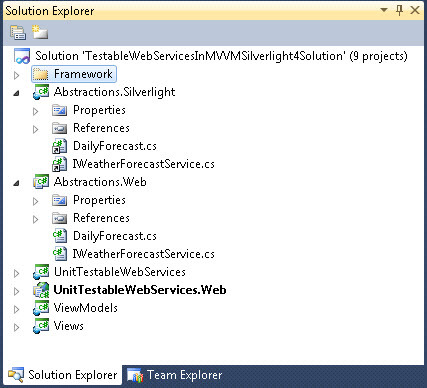 Lets face it, consuming WCF Web Services from your Silverlight application can be pretty hard. I mean hard to do it in a clean way off course. 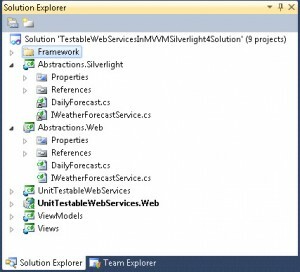 Yes we all know how to create a Silverlight enabled WCF Web Service from Visual Studio but things become messy from that point. First question is how to invoke methods of the web service? Should we use Add Web Service Reference from the Visual Studio and and get the service proxy generated for us by the IDE? If you go down that route, its easy to start and you will be invoking web service methods asynchronously in no time, but you will pay the price for that simplicity later, that is for sure. Next problem is how to Unit Test those web service calls – its impossible to abstract the generated proxy in a clean way. Then if you change your Web Service signature, you have to rebuild your Proxy. This can be troublesome especially if more than one person is working on the same project (can be avoided using build scripts to rebuild proxy automatically during compilation but still i don’t like that). Also invoking web service methods asynchronously is tedious work in terms of writing the same code over and over again. You have to subscribe to the OnCompleted event, and then invoke the actual asynchronous method, and then when your OnComplete handler is invoked, you can process the results of the web service method. Not to mention the lifetime of the generated proxy, and handling exceptions that could be thrown in the service etc. So as we see Visual Studio (or command line) proxy generating helps us in many ways but also brings new problems that are hard to solve. If this list of features looks interesting to you then you will soon see that all this is possible in a simple way by using ChannelFactory<T> and creating the Web Service client channel for the web service manually. So lets start: In our example we will be using a fake WeatherForecast web service that will have just one method GetForecast and it will accept DateTime as parameter and return a simple class DailyForecast as a result that will have some fake data just to have something to work with. Note the DataContract and DataMember attributes, they must be provided in order to receive the class on the client properly. Since we are to consume the web service on the Silverlight client we must make available all the classes to the client side. Here is how we are going to accomplish this: We must define service contract interface and all the classes that the service will return both on server and on the Silverlight client. We will do that by creating a Abstractions.Web class library project that will hold the service contract interface IWeatherForecastService all the needed Data Transfer Object classes (in this example its just DailyForecast class), and then we will also create Abstractions.Silverlight - Silverlight class library project where we will add the same classes (DTO’s and service contract interface) as links – by going to to right click menu on the project and choose Add -> Existing Item and add all needed files and click on Add As Link button instead of Add button. As you can see we are defining the WebServiceClientFactory of TWebService that will expose a web service client instance WebServiceInstance if we want to call it directly but more important will be the generic Invoke method for generic asynchronous calls that will allow to call any method on any web service in a simple way just by specifying the parameter, then the begin and end method we want to calla and a method that should be called with the received results when web service call is finished. Our helper class will also implement IDisposable so we can cleanup properly. Let us investigate the Invoke method. From its signature we see that it is a generic function and that it has two type parameters, TParam that is the type of the parameter sent to our web service when we invoke the web method, and TResult that is the type of the result we expect from the method. Then there is a object state that we want to send to the web service method (we can pass NULL there if we don’t need it). And then comes the fun part: Parameter beginOp is a BEGIN* method that will be invoked, and parameter endOp is the END* method that will be invoked for the web service call. In our case we will supply here BeginGetForecast and EndGetForecast methods using the WebServiceInstance property of the same factory class. But its important to note here that if our web service would have other methods that support asynchronous invoking with these BEGIN* and END* signatures, we could call them in same way, just passing another pair of Begin* and End* methods. So this class is just a wrapper around the TResult we would usually receive from the web service method call and it adds just two more properties: boolean WasSuccessfull and Exception. 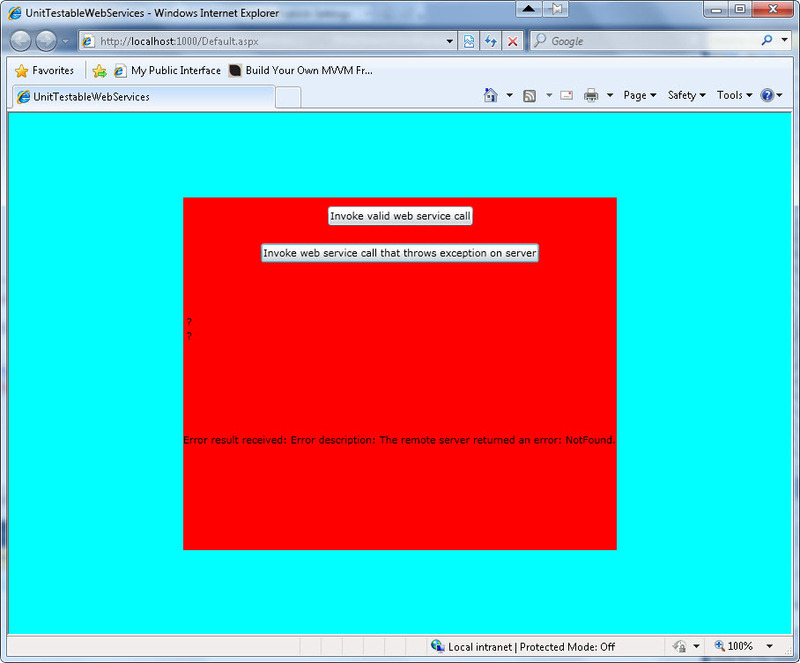 If web method call is executed without problems WasSuccessfull is set to true and Exception is null, and on the other hand if there is some exception thrown during the invocation of the web service method call Exception will hold the Exception thrown and WasSuccessfull will be set to false. And you can use this generic helper class to create wrapper around ANY web service exposed to your Silverlight application. You just instantiate this class giving it the contract interface of the desired web service and URL of the web service. WebServiceClientFactory will do all the plumbing for you and create ChannelFactory and web service client and expose it in WebServiceInstance property. Then you can use Invoke method of the class to call ANY web service method with single line of code (you need on complete action to receive the result but you cannot avoid that – its asynchronous call after all). <TWebService> and then it will create a communication channel to communicate with web service of given type on the given URL. There is a another constructor that accepts Binding if you want to provide your own. As you can see no big deal there, we just invoke the BEGIN* operation with lambda method as complete handler where we wrap the call to END* operation in Try..Catch so we can recover from any exception. If there was an exception we set WasSuccessfull to false and Exception property. If all went ok we populate the Result property with the result of the web method call and then we invoke the onComplete action that was supplied by the user of the class. But we make sure that we invoke it on the UI thread just as a convenience for the user so he does not need to do it by himself. Previously, we subscribed that method to the OnFaulted event on the channel. Other parts of the class are not too much interesting so you can dig yourself if you want. So lets see how we would use the class in our view model. As you can see from the ForecastViewModel we have a command that’s invoking the web service called GetForecastCommand and we have a action method OnResultReceived that receives the result. 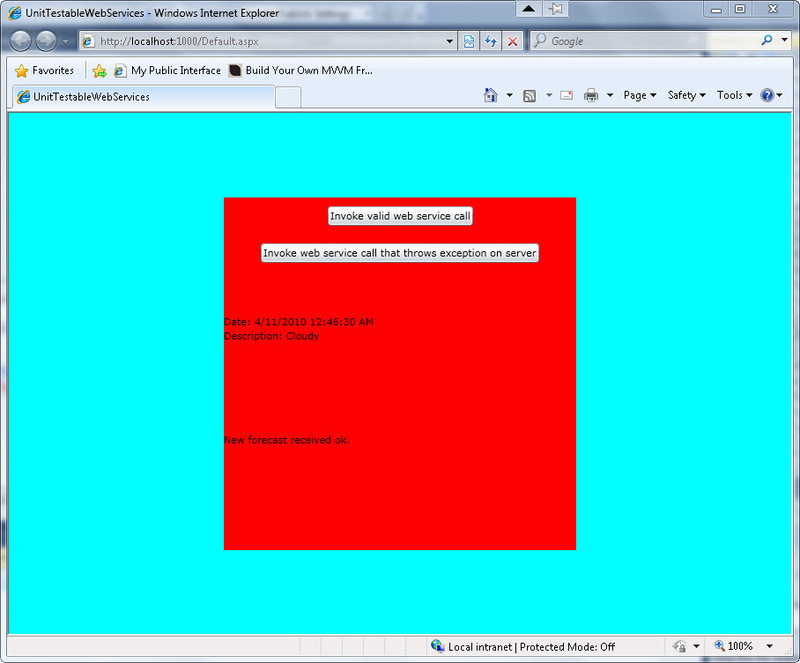 If the web service call fails we set the ForecastThatWasReceived to null and we set the StatusMessage to the Message of the Exception we received from server. As you can see we have two buttons, each wired up to the same GetForecastCommand but with different parameters. One is sending the current date to the server and other is using the BadForecastDate databound from ViewModel which is set to DateTime.Min. When web service receives any other date then DateTime.Min it returns valid instance of DailyForecast class and if it receives DateTime.Min it throws some bogus exception. This is how we will test our WebServiceFactory class to see if it can handle the exceptions thrown on server side or not. you can test the live sample application here. As you can see when we click on first button we receive the valid forecast and when we click the second one, we will receive the error but it will be catched and wrapped in our AsyncWebServiceCallResult class and our UI won’t hang and we will be able to recover from that error and immediately invoke the web service call again with different parameters. So this should help us handle the web service with greater ease right ? But wait! We are not finished yet! Those of you that were paying attention noticed i promised a unit testable web services. So lets do that also. 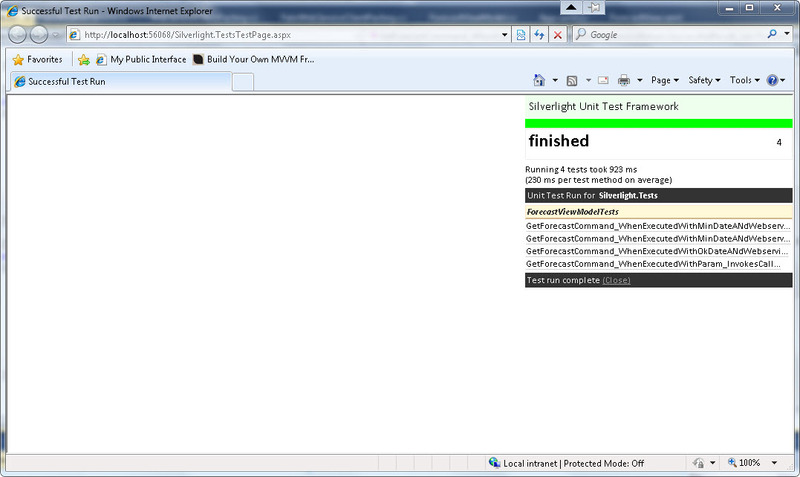 We will add another SIlverlight application to our sample code and set it up with Silverlight Unit Testing Framework. Also we will reference all the needed projects – ViewModels, Abstractions.Silverlight, Framework.Abstractions and Framework.Implementors. Also we need to make a fake WebServiceClientFactory and IWeatherService implementations so we can use them in our tests instead of the real implementations. As you can see it does not do much, its just a manually written mock class we can use in our test instead of the real web service client factory. It allows us to check what was sent to the Invoke method as parameter and it allows us to set what will be sent to the OnComplete handler when client code invokes some web service call. Again its very simple its just a Stub class that allows us to instantiate and use it without really calling it. And when we run them, as you can see from the screenshot below, they are all GREEN! So there you go, we have completed in this lengthy posts most of the tasks we set in the beginning. Off course there are many places for improvement but the basis of a simple way to invoke WCF web services from Silverlight and MVVM and Unit Testability are there. If you have some comments and improvements to the solutions presented here i would be happy to hear them out. You can download Visual Studio 2010 Solution with the code from this post if you want to run it locally. In the previous post we covered how to show Views and how to wire them up with their ViewModels while preserving ability to correctly see their preview in Visual Studio and Blend design mode. In this post i would like to tackle another problem that is very common in MVVM and yet very rarely done correctly. I will try to provide simple and platform agnostic way of showing Modal Dialogs in MVVM manner without any code in View (later in the post we will reuse same concept and provide way to show simple message dialogs in the same way). For those of you that have no patience here is the demo application that shows dialogs in action. On the main page there are two identical views each of them showing a list of users. 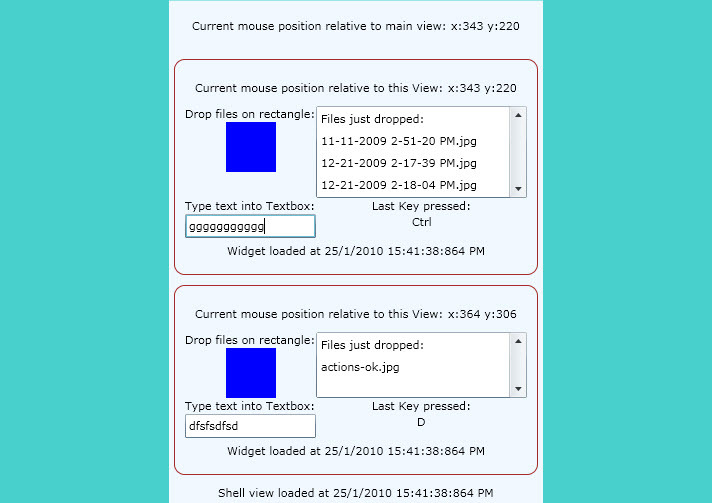 For each user if you click the Edit button you will see the modal dialog to edit users properties. Del button shows the message dialog to confirm deleting of the user n or to cancel it. So lets begin: Actual implementation of the concept will be done in Silverlight 4 but it can be easily and without any pain converted to any other UI platform like WPF etc. 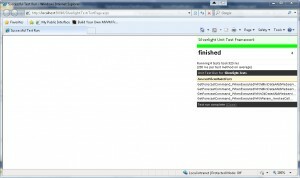 Nice thing that could help us a lot is that Silverlight 3/4 comes with very handy ChildWindow control that is perfect fit for what we are trying to do, so we will try to reuse it in smart way. The question remains how to use Silverlight ChildWindow class with MVVM pattern and to remain decoupled from anything that is platform specific about it. But its important to note here that IModalWindow contains only pure .NET constructs so it does not have anything Silverlight specific so that means we can implement this interface and create modal dialog controls in any .NET platform (WPF, WinForms etc). IModalWindow has Show and Close methods, then it has DataContext so we can bind it to its ViewModel, then there is DialogResult boolean property to tell us if user confirmed the action or not, and it has event handler so we can hook to it when dialog is closed to pickup some results or do other actions (if we need it). In order to be able to actually show dialogs that implement IModalWindow to our user we will introduce another layer of abstraction – it will be service that implements IModalDialogService interface that will have generic methods for showing the dialogs and completely hide the details of the implementation – as we said this should be platform agnostic so interface will contain nothing specific to Silverlight. Our service interface defines two methods, first is one when when we want to specify OnClose handler so that we can do some action when dialog is closed and second overload is for showing modal dialogs in ‘Fire and forget’ mode without knowing when or how the dialog is closed. Both ShowDialog methods are generic, accepting TViewModel type where we specify type of the ViewModel for our dialog (usually this is ViewModel interface). If we don’t need ViewModel for the dialog we can always set this to null. So when showing dialog we pass the actual dialog – the View (i will explain later how we will get it) and its ViewModel and optionally we define an Action that is called when the dialog is closed (with the ViewModel instance of the dialog as the parameter – this is how we can get the results of the dialog or data user entered on the dialog etc). Implementation as you can see is very simple. 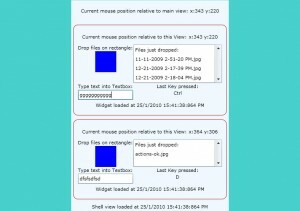 Service just sets the passed ViewModel to the DataContext of the passed dialog view, attaches the OnClose handler if we provided it and finally shows the view. So its just simple ChildWindow control, that has few TextBoxes to show and edit details of one User instance. And in the codebehind of the ChildWindow control we just mark it as implementor of our IChildWindow interface (and we set the DialogResult to true if user clicked OK button, but this can be done in ‘pure’ way via DelegateCommand i just used codebehind here for simplicity and because its not part of the business logic, its concern of the UI to tell us if the user closed dialog by clicking on OK button or not). So all this gives us a completely platform agnostic solution to modal dialogs, and yet we used the powerful ChildWindow control that comes with Silverlight. If we later decide to implement our modal dialogs in a different way we can do this easily just by creating a different control that implements IChildWindow and we are cool, nothing needs to be changed in our code that shows the dialogs. So now how would we use this dialog in code? There is one more peace of the puzzle to solve. We need to register our dialog controls somehow so we can easily pass them to our IModalService to show them so i will use ServiceLocator pattern for this. As you can see we are registering (among other things) EditUserModalDialogView that is in fact ChildWindow control as implementor of IModalWindow interface under a name from constants (Constants is the class holding distinct string names for each of the dialog types we want to use in application). So now that everything is set, and our ServiceLocator knows of our dialogs, we can retrieve new instance of any of our dialogs to show them from the ViewModel of some view (when some button is clicked inside a DelegateCommand etc). In this example i have only one dialog type that is implementing IModalWindow interface – EditUserModalDialogView, but i could have had many different types of dialogs that i will be showing to users so i would register them all in the Boostrapper as implementors of IModalWindow but under different named constants. Then i would just retrieve the one i need by asking my service locator for a type that implements IModalWindow and supplying a string key that would determine which dialog exactly i need. So basically im setting the DelegateCommand (see details of the DelegateCommand implementation in the project attached to the post) with code to retrieve the Edit User dialog from the ServiceLocator. Then im calling services ShowDialog method, passing the new instance of EditUserModalDialogViewModel as the ViewModel of the dialog (containing the user instance i want to edit) and im passing lamda for onDialogClose callback to remove old instance of the User from Users collection on ViewModel and replace it with the new one we received from the dialog. Off course im first checking if user clicked on Ok button (using dialog.DialogResult property to check that). And there you have it: simple MVVM solution for modal dialogs that you can port to any platform and implement with any kind of control or popup you want. To show this concept in more detail i created another similar service to show message boxes to the user. Again its very simple, we are using the built in Silverlight’s MessageBox class to show the actual message box but later we can decide its not good enough and implement it in another way (maybe with 3rd party message box component etc) yet our code in ViewModel wont change since it will be talking only to our interface. What i do here is just set the DelegateCommand in ViewModel to first show the message box with Ok and Cancel buttons and if user pressed Ok do some action – delete from the list. So i think this two solutions covered all design goals we set on the start: we have decoupled way of showing modal dialogs and message boxes currently done in Silverlight but they could be easily converted to another platform. Also approach is MVVM friendly without any hacks so any pattern purist can be satisfied with it. If you have some concerns or suggestions on this approach i would be happy to hear it! Here is the attached VS 2010 solution with full source code from the post. Live demo of the application showing modal dialogs and message boxes flying around the screen.